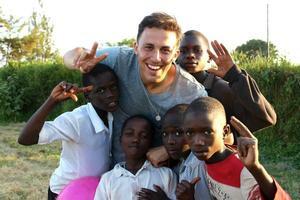 Robert Callus, StMM class of 2007, CGHS class of 2011, and Notre Dame class of 2015, spent nine weeks this past summer in the village of Kyarusozi/Cherasozi, Uganda. The village is supported by the Brothers of the Holy Cross, a mission that provides support to many of the villages children and families. Several StMM alumni were part of the Cardinal Gibbons production of Lend me a Tenor, the Tony-nominated play by Ken Ludwig. Of the eight cast-members, three were StMM graduates, including Brandon Dini (lead role of Max), Brooke Eichenlaub and Cameron Hahn. All three were part of the StMM class of 2010 and will graduate from Gibbons this spring. In addition to the cast members, Julia Wray was an assistant director and Alex O'Neill, Jessalyn King and Natalia Morales were part of the crew. Christian Boletchek, StMM Class of 2012 and Green Hope High School Class of 2016, is part of the Sounds of Jazz Trio. 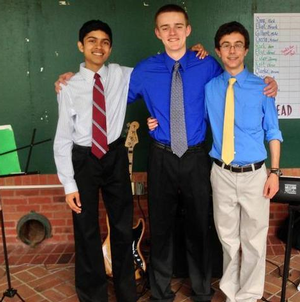 Christian and two friends have performed in a few local restaurants, and have raised some money for the GHHS band. See the rest of the story here.